Some wine festivals are mob scenes—hundreds of people crammed under a giant tent, all pushing their way with glass extended to the overwhelmed winery staff. 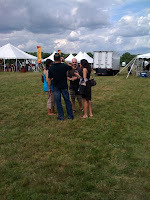 But the East Coast Food & Wine Festival in Pennington, NJ, offered a bucolic alternative to those over-crowded fests. As soon as my car bumped over the lumpy clover field to the parking, I knew I had reached the heart of New Jersey farmland, a heritage forgotten by out-of-staters who have heard too many “What Exit?” jokes. But this is, after all, the Garden State. Pints of New Jersey blueberries were stacked high, their purple-blue hue peeking through their clear plastic containers. In the produce tent, vendors sold lettuce harvested just two hours before, as well as fresh beets, peas, and more. There I met Mikey Azzara, a friendly pioneer of the Jersey locavore scene who runs Zone 7. He drives to farms to collect just-picked produce and then delivers it to local restaurants. But what about New Jersey wine? All in all, it was a mixed bag, and some wineries showed much better than others. Unionville Winery offered the best reds I tasted. I particularly liked their more expensive (still only $22-$26) reds, including a medium weight, fruit-forward 07 Montage, which blended 50% Chambourcin and 50% Pinot Noir. 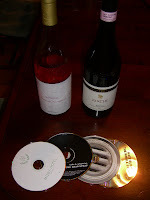 I also enjoyed The Big O, another 07 that was a big, tannic wine with lots of fruit. This is another 50/50 blend, mixing Cabernet Sauvignon and Cabernet Franc. I’m guessing the Cabernet Sauvignon doesn’t ripen sufficiently to make a varietal wine, but it blended nicely with the earthy Cab Franc. Unionville is able to grow their own Merlot, while another winery I won’t name sources grapes out of state for theirs. This is one of my pet peeves. If I’m visiting a local winery, I want to taste the local wines, not ones from the West Coast or New York. I suppose it’s a money-maker for them to offer Washington State Pinot Noir, but I question how NJ can establish itself as a quality wine-producing state if its wineries sell out-of-state products? I believe that more NJ wineries need to embrace lesser-known varieties that grow well in their soil and climate, rather than trying to offer the standard Pinot Noir & Cabernet Sauvignon. 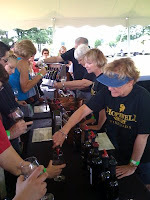 For example, Hopewell Valley Vineyard, the festival host, offers a flavorful Chambourcin. Originating in the 1950s in the Loire Valley, Chambourcin grows very well in NJ and I'd feel safe buying it at most NJ wineries. It produces a medium weight red wine with rich ruby color, good fruit, and light tannins, and it pairs well with lots of dishes. One thing that a lot of wineries got dead wrong was their Chardonnay. I tasted more than a couple that were over-oaked. One of my tasting notes said, “I feel like I’m sucking on a 2 x 4.” I asked Gary Pavlis, a festival speaker who judges NJ wine competitions, “Why do so many NJ wineries over-oak their wine?” His answer was that they didn’t get enough flavor from their fruit. I thought about the European wineries that wouldn’t produce any wine during a bad harvest in order to preserve the quality of their brand, and wished the NJ wineries would make the necessary changes in what they grow or how they grow it to eliminate the need for such masking techniques. I found one quality Chardonnay that was not available for the general tasting. This buttery Chard from Unionville retails for $45…which made me question how many people would pay that much money for a NJ wine, even if it is quite good. 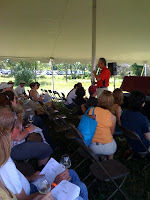 My choice for the best priced, high quality white wine was at Cape May Winery’s booth: Victorian White. This blend of white grapes produces a pleasing, medium-weight wine, light gold in color with a punched-up, fruit flavor. When I asked several winemakers and local experts, the consensus was that New Jersey wine is improving, but it has a long way to go. But as far as wine festivals go, the East Coast Food & Wine Festival got it right: multiple tents that were leisurely spaced-out, a great-sounding country band, food vendors offering delicious gourmet fare, and terrific speakers including TV Chef Michael Colameco, Judgment of Paris author and journalist George Taber, and the charming chef and wine expert Maureen Petrosky. On a sunny, blue-sky weekend, the East Coast Food & Wine Festival was the place to be. Italian wine is a vast subject that many of us don’t know a great deal about. But there is much to explore beyond the familiar straw-wrapped Chianti bottles. The country offers many styles of wine from everyday sippers to glorious age-worthy bottles. One of the most challenging things about Italian wine is all the different varieties. Take Piedmont, for example. This storied wine region is in northwest Italy. On a clear day, you can see the Alps from its sloping vineyards. In Piedmont alone, three significant wines all start with the letter B.
Barolo – The grape of Barolo wine is Nebbiolo. Barolo itself is a charming hilltop town. As you drive up the winding road, you immediately see Barolo Castle, which now houses a stylish enoteca where you can sample fleets of local wine and get an overview of the area’s wines from a multi-lingual guide. 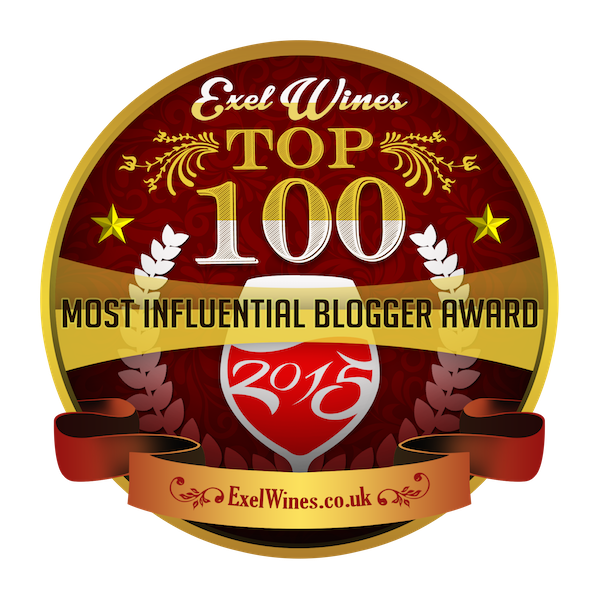 During my time in the region, I learned that Barolo is the wine of kings & the king of wines. This red is a big, tannic beast that often requires at least a decade to settle down and become a dry, complex red whose tannins have been tamed. The problem with loving Barolo is its price: I haven’t seen one below $50 this side of the Atlantic. However, in Italy, I found some relative bargains, so I snatched up some 2004s & 2005s, which I plan on aging at least a few years. It’s nice to have some wines to look forward to in the future. Barbaresco—Here is another wine based on Nebbiolo grapes, but it’s grown in different regions than Barolo. I visited a fine Barbaresco winemaker at Paitin, a family winery that boasts an amazing 15th century wine cellar. Silvano Pasquero-Elia took me out on a balcony and showed me the sweep of tongue-shaped hills that comprise the Langhe mountain range. The white-tinged soil in his town of Bricco de Neive is perfect for cultivating grapes for Barbaresco, which is still a big, age-worthy wine, but with a fresher nose and slightly less firm tannins. Silvano was gracious enough to take me through a tasting of his wonderful Barbarescos, and made a present of an old vines 2004, which I look forward to opening in the future. Barbera – One resident told me is that Barbera is the heart of Piedmont. Although some may argue that Dolcetto, a jammy, simple red wine, is the daily wine of the area, my guide at Rocche Costamagna, confirmed that Barbera is their everyday wine, while Barolo is the weekend wine. During the months before my trip, I sampled Italian wines of the regions I would visit and developed a real fondness for this wine. Barbera has that dusty, potpourri-scented, dry Italian wine thing going on, and it has high acidity, making it an easy match for lots of foods, including red-sauce meals. Unlike Barbarescos and Barolos, Barbera is delightful when young. In the US, it often is sold in the low 20 dollar range—not the cheapest, but certainly not the most expensive foreign wine and well within my own threshold of wine spending. Now if you’re thinking “Haven’t I heard of another famous B wine from Italy?” you’re right. That would be Brunello de Montalcino, but this isn’t produced anywhere near Piedmont. Those vineyards are hundreds of kilometers south in Tuscany and made from Sangiovese grapes, which is also the dominant grape of the blend of our old friend, Chianti. Check out some Italian wine soon. Confusion never tasted so good.